This document is intended to clarify the Election and Voter Services Technical Committee's scope and function by organizing the various elements of the design and delivery of the standard. These areas are depicted in the graphic at the end of this document. This plan was laid out with the help of Anwar Choudhury and John Borras of the UK Cabinet Office, TJ Rainsford of IFES, and Gregg McGilvray. It was compiled from input from the mail list and the three Committee meetings held to date. It was fashioned by taking a project management view of the process and indeed may lead to an organized project plan to ensure that deliverables are met. Please review and comment upon this document. 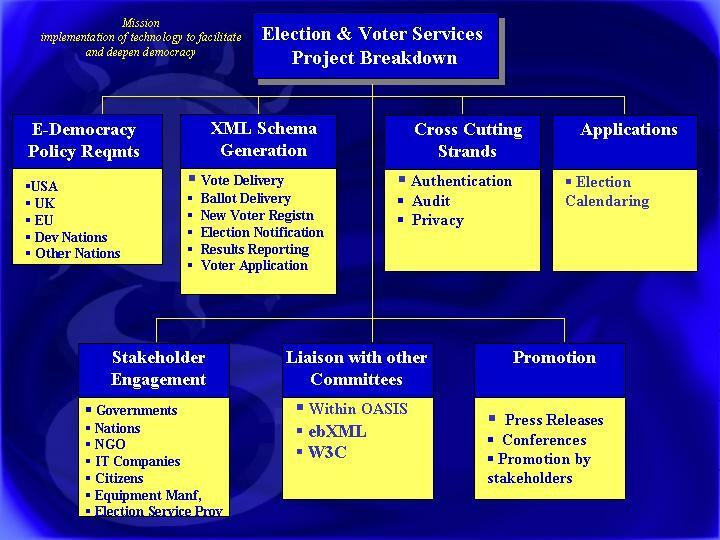 Three main functional areas are apparent; the technical development issues, non-technical issues, and those related to e-Democracy that are not directly associated with elections or voter services. Within the technical area are three sub-areas; the schema development, cross cutting project concerns, and the identification of applications which may require schemas. This latter category will be a way in which we can match schemas to data uses and ensure that all data interchange is identified. Security (including authentication, authorization, auditing, privacy, etc.) would be included as a cross cutting strand as it concerns all aspects of the project. The non-technical concerns are also threefold; stakeholder engagement, liason building, and promotion. These areas are concerned with gaining support for the standard through forming alliances with other organizations whether they be users or other technical organizations. This will rely on leveraging personal and professional contacts through direct communications or by way of press releases or by participating in trade shows, professional associations, and the like. The final area of interest revolves around identifying and understanding the policy requirements of the various nations and working to ensure that the committee's schemas are in line with these policies, help promote these policies, and gain the confidence of policy makers worldwide. This would also be the place to address other e-Government and e-Democracy issues, those not directly associated with elections or voter requirements. This area could recommend sub-committees or ad hoc committees to address a variety of issues without having these issues distract the main purpose of the TC, namely to produce the XML schemas. The diverse expertise of this Committee make this project quite attainable. Please review the graphic below which lays out the project scope. Please comment through the mail list.